I'm fascinated by beauty brands from around the world and find it interesting to hear about the different products and rituals which women in different countries use. With this in mind, I was keen to try Terre d'Oc Beaute du Monde Indian Radiant Face Serum. The Terre d'Oc range takes inspiration from the best beauty secrets, rituals and traditions of women around the world and uses it in a natural product line-up. The range is divided into sub-ranges, each based on a different country and includes Bali, Japan and Morocco to name just a few. 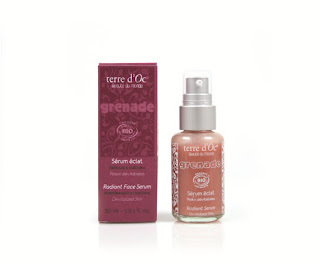 I've recently been using the Terre d'Oc Indian Radiant Face Serum which has been designed to feed skin with an antioxidant, Omega-3 and vitamin rich blend of Pomegranate, Hibiscus and Pink Peppercorn extracts. 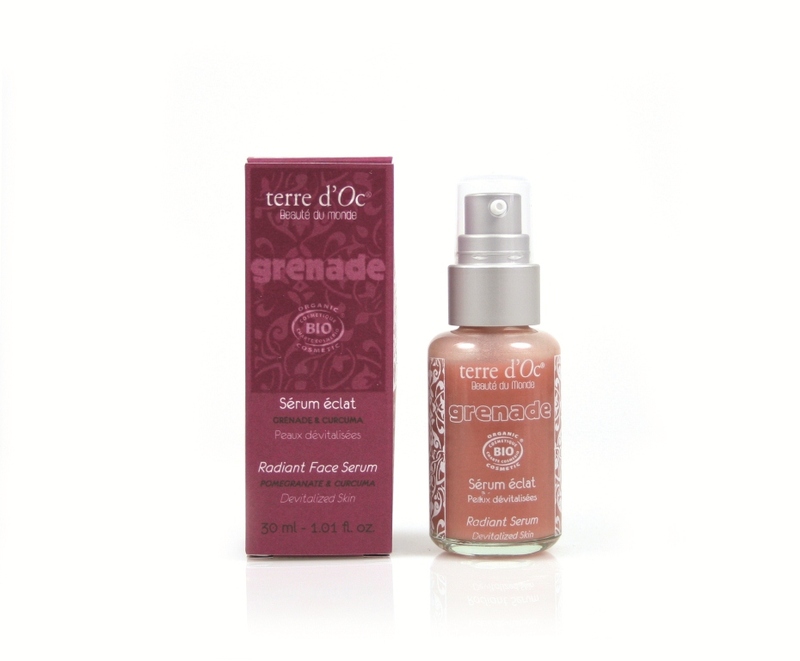 Terre d'Oc Indian Radiant Face Serum is presented in a red cardboard box which hints at the exotic influences behind the product but which doesn't feel particularly luxurious. On opening. there's information printed on the inside of the box which can be opened up to reveal a magazine style editorial with information about Indian rituals and traditions. This might not appeal to everyone but I liked it and felt that it communicated the brand message effectively. The bottle itself has a functional pump dispenser and I was impressed that it delivers the perfect amount of product to cover the face and neck in just one pump to avoid wastage. Before trying Indian Radiant Face Serum, I was worried that it would have a sickly sweet scent but I was proven wrong. On first impressions, the scent is very pleasant and fruity and it reminded me of the REN Radiant range. However, as the scent develops as it warms on the skin, it takes on a musty "incense-like" fragrance which I found rather overpowering and this is one of the main factors which would put me off repurchasing, although of course, fragrance is very personal. Having said this, I couldn't notice the scent once the serum had dried. The formula is lightweight and easily absorbed. A little goes a long way and the bottle lasted me approximately 2 months. Whilst I didn't fall in love with Indian Radiant Face Serum (mainly due to the scent), I have to admit that it delivered on its promises. My skin was left feeling smooth, nourished and glowing. I was particularly impressed with these results given that the changable weather we've been having here in the UK would normally play havoc with my skin. Although I found the product to be effective and liked that it contains high quality natural ingredients, I was nonetheless surprised to discover the price. At £32.95 for 30ml, it's more than double the price I was expecting and compared with similar brands, I'm not convinced that I could justify a repurchase even if I had been wowed.